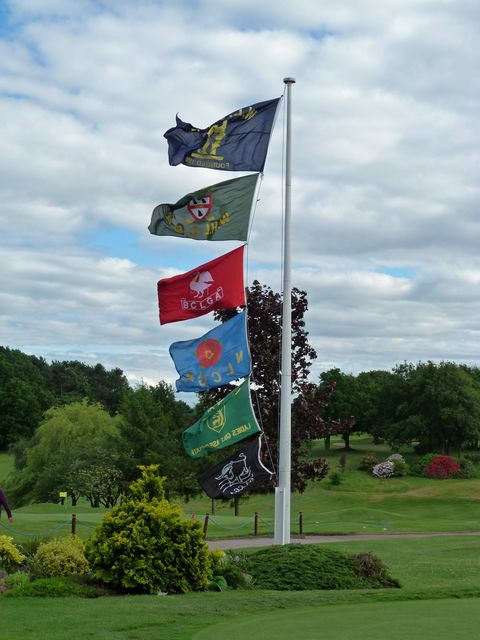 22nd June saw the commencement of the 2015 Midlands South County Match Week where the six Counties - Warwickshire, Worcestershire/Herefordshire, Berkshire, Buckinghamshire, Oxfordshire and Northamptonshire - held at Harborne Golf Club for the next five days. 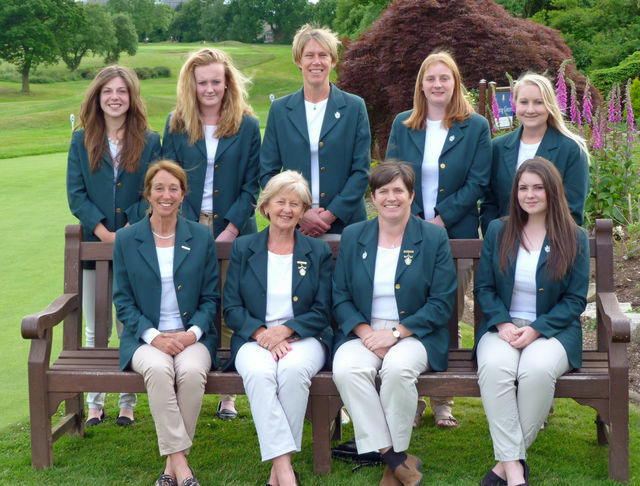 There are 3 Foursomes and 6 Singles matches played on each of the five days with all Counties competing against each other. What follows is the review of the week. On paper our Warwickshire Team looked impressive and expectations were high. We had in the Team for the first time this year, Courtney MORRIS, Adelle MIDDLETON and Gemma BRADBURY with a further two young ladies who had returned from study in USA - Elizabeth MALLETT and Charlotte HARTSHORN to join the experienced other members. Weather wise we were hoping for some warm sunshine on this mid summer day, but alas, the sun only came out occasionally and the wind blew constantly making conditions quite challenging. Harborne Golf Course had been prepared magnificently with excellent greens running fast and all competitiors were raring to go. 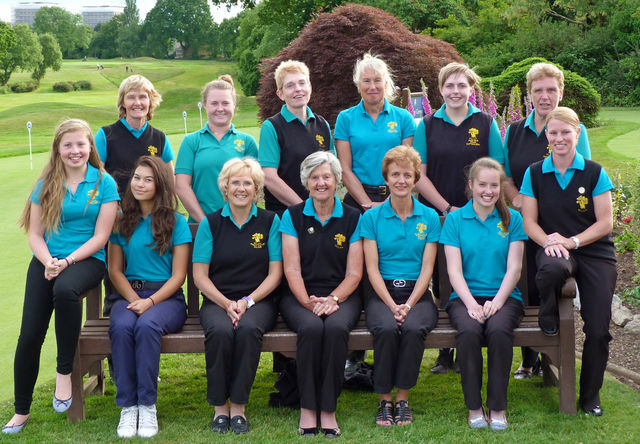 Warwickshire were up first against Berkshire at 8.30 a.m. and the pairings for the Foursomes matches were: Elizabeth MALLETT & Lisa BARTON, Rachel RUSTED & Hannah McLOUGHLIN and Charlotte HARTSHORN & Katrina GANI. If first drives were anything to go by we were in for a treat with high expectation for our team. What unfolded, however was not quite as we imagined, as at the close of play in the morning we were down 2 matches to 1. Elizabeth & Lisa who were playing a very experienced pairing were 3 down after 8th but on the 9th one hole was pulled back when they won this hole with a Par. This continued throughout the back 9, with our girls going behind to 4 down with 4 to play. 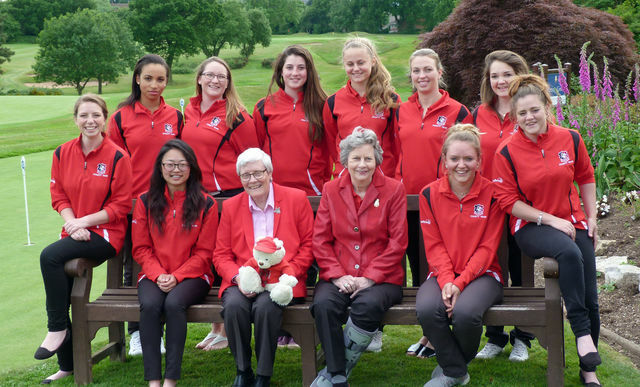 They pulled 2 back but eventually lost their match 2 and 1 after a long putt was holed by the Buckinghamshire Team. Next came Rachel and Hannah who got off to a poor start being 6 down by the turn, despite some very good golf being played. Much as they tried, our girls just did not have any good fortune today and they remained 6 down with 5 to play, thus losing their match. On the brighter side, the team of Katrina and Charlotte got off to a spendid start and continued to be 4 up by the turn. They played Par golf throughout the back 9 with their short game and putting shining through today, eventually posting the first win the Warwickshire, 6 and 5 - an excellent start for them. In the afternoon Singles matches, Charlotte was once again on fire with her caddy stating that she didn't hit a bad shot throughout with excellent putting as well. Mostly Pars, but with just one Birdie and when her opponent put her 2nd shot in the hedge on the 13th, Charlotte finished her match 6 and 5. An excellent day's work by any standards. Second win of the afternoon came from newcomer Courtney, who battled round the 18 holes to win on the 18th, 1 up. An excellent front 9 with a mix of Birdies, Pars and Bogies made her All Square after 9 holes. She continued in this vein throughout, going 1 up on 12th, then losing on the 13th, but with a win on 15th followed by 3 pars, she completed her task of a win. Lisa brought up the rear in the Singles and her experience showed. She was 1 down after 7th, having given away the previous 2 holes, halved the 8th and then won the 9th to be All Square at the turn. She won the 10th with a Birdie, 13th with a Bogie and 16th with a Par to go 2 and having halved the 17th in Par 5's, she eventually she won her match 2 and 1. Regrettably the three other singles matches were lost this afternoon even though some excellent golf had been played. The girls just did not have the rub of the green and this made the difference. A very good day's play for the Warwickshire Team and even though the day's score stood at a Loss of 5 matches to 4, everyone gave of their best and are now quite determined to do better tomorrow! Tomorrow Warwickshire have Start Times of 9.30 a.m. and 14.30 p.m. and the opposition is Buckinghamshire. We wish them well. On Day 2, the matches for Warwickshire were against a very young Team from Buckinghamshire. Whilst yesterday was extremely cold and windy, today started much better and as the day went on it just got hotter - perfect golfing conditions. Foursomes pairings for this morning were: Charlotte HARTSHORN & Katrina GANI, Claire HOWELLS & Charlotte PRIDDLE and Gemma BRADBURY & Adelle MIDDLETON and they commenced play at 9.30 a.m.
After the Front 9, Charlotte and Katrina were All Square having played very well, and by the 13th they had moved to 3 up and going well. However the wheels fell off somewhat and they soon lost the next 4 holes with putts just lipping out. Standing on the 18th 1 down, they both tried fearlessly to get that win for this hole. Both sides on the green in two, Charlotte putted first, once again just missing out and with her opponent missing her putt, the hole was halved in Par. Such a near miss after some great golf. Claire and Charlotte had a ding dong match with nothing much in the result all round and by the 18th they were 1 up - how we needed a win here. Usually very straight hitting Claire on this occasion went left landing on the 1st fairway, with Charlotte hitting the 2nd shot to the edge of the green, whilst their opponent's ball had landed on the green from the Tee shot, albeit some way from the hole. Sadly after all the efforts of the morning they lost the 18th and thus halved the match. After 9 holes Gemma and Adelle were 1 down, again having played some excellent golf. Highlight of the back 9 or indeed the round was on the 387 yard, Par 5, 11th. Gemma hit a very long drive over the water at the bottom of the hill followed by Adelle striking her ball so well that it barely missed the hole for an albatross. They did get a very well deserved Eagle though! The pair were dormie 3, pulling one back with Birdie on 16th hole. They halved the 17th when Buckinghamshire sank a very long putt for Par, thus losing the match 2 and 1. After such splendid golf this morning, how sad it was to gain only half a point especially when it was just so close. Singles matches this afternoon commenced with Elizabeth MALLETT leading the way. By 8th Tee, she was 1 down, but managed a terrific Birdie on that hole (Par 5) for a win, even though she took her 2nd shot from the 2nd fairway! Halving the following 3 holes, she then made a great putt to go 1 up on12th. Elizabeth then lost holes 14 and 15 and won the 16th and halved the 17th. Standing on the 18th Tee at All Square, Elizabeth needed to pull something out of the bag and my she did not disappoint and her ball flew towards and then on to the green, leaving herself a medium up hill putt. With 2 putts, she won the hole and the match 1 up - a great start for the afternoon. As her caddy said "there was some awesone putting out there this afternoon!" Next out was Charlotte HARTSHORN who was 3 up after 6 and with two further halves on 7th and 8th and a loss to Par on 9th, she stood 2 up at the turn. A Birdie 3 on 10th made her 3 up but then she lost the next 2 holes (1 to Birdie). After halves on 13th and 14th she won the 15th to Par, quickly losing the 16th to Par. With Halves on 17th and 18th, both in Par, Charlotte had provided our second win of the afternoon, once again having played brilliantly. Gemma BRADBURY, playing in her first Singles match went 2 up after 2 holes, losing the short Par 3 and then the Par 4, 5th, she went on to win holes 6 and 7 and marginally halved the 8th when her ball lipped out, leaving her 2 up after 8 holes. 10th she lost to a Birdie and then 11th to Par - All Square. She won the 12th, lost the 13th, then the 16th to Birdie and then Halving the 17th in Birdie 4's, the match was over with Gemma losing 2 and 1. My, having played such fantastic golf all afternoon, you can only say that between the girls, they provided some wonderful entertainment, not to mention stress, for the caddies and spectators. Regrettably, Lisa BARTON came up against an opponent who could do no wrong and who by the 13th, was 3 under par!! It wasn't that Lisa played badly, it was just that her opponent, who hit her ball a country mile, could do no worng. Tomorrow is another day though and she will come back, I am sure. The final 2 matches featuring Courtney MORRIS and Claire HOWELLS were Halved. Courtney had some 4 Birdies in her round but even so by 18th Tee was 1 down. Both drives went right, with Courtney barely having a shot to the green. She managed though and made the green and with 2 putts made a Par 4 to Bogie 5 and thus Halved the Match. What a tenacious young lady this is, battling to the very end! In the words of the Caddy, Claire's match was nip and tuck, again with some excellent golf being played by both sides. As in the previous match, standing on the 18th, she was 1 down. An excellent drive to the front of the green on this 220 yard, Par 4 hole, a Chip and 2 Putts saw her win the hole in Par 4 and thus make a Half. Wow, have we seen some great golf from our Team today. On another day, they could have easily won but they came up against a Buckinghamshire Team who just did better on the day, winning 5 1/2 to 3 1/2. What an inspiration they were to us all spectating though - we have been entertained thoroughly. Wednesday sees Warwickshire playing Northants with matches commencing at 9 a.m. and 13.45 p.m.
Northants were the opponents for the Warwickshire Girls for Day 3, Wednesday 24th and once again the weather was kind throughout the day, albeit a little breezy. The pairings for this morning's Foursomes were: Elizabeth MALLETT & Gemma BRADBURY, Kelly KNIGHT (in her first match of the week) & Courtney MORRIS and then once again Charlotte HARTSHORN and Katrina GANI. All players came out with guns blazing today, quite determined that they were going to post their first win of the week - and they did not disappoint!! All three pairings had managed to be 2 up after 9 holes which was very encouraging and whats more, they were playing extremely well. Elizabeth & Gemma went on to post a good win, 2 and 1, quickly followed by the dynamic duo of Katrina and Charlotte, who won by 5 and 4 - We can't lose this morning now. The second match out saw Kelly battle their way to the last hole which they Halved. What a start to the day, scores of 2 1/2 to 1/2 for Warwickshire and this should encourage the afternoon Singles players. The Warwickshire Team seemed to be in a hurry to get in this afternoon as no match went all the way. Elizabeth MALLETT led the 6 singles games out and was quickly 2 up after 2 holes which she kept until the turn. After the 13th hole she had moved forward to being 4 up. Then on the 14th hole, 166 yard Par 3, Elizabeth sank a 35 ft putt for a 2 and thus ended her game at 5 and 4. Katrina continued with the winning ways when she won her match 4 and 3, having been 1 up after 9 holes. Afterwards, Katrina said that she had played some very steady golf, taking the advantage whenever possible. At this stage, the Team were 4 1/2 games to the good. Lisa avenged her loss of yesterday with an excellent win 3 and 2 today. Her never give up attitude was put to the test however as she was 3 down after 7 holes, but then won the next three holes to go All Square after the 10th. Never losing a hole after the 10th, winning 3 holes and Halving a further 3, she made it a third win of the afternoon. Claire HOWELLS had a magnificent win this afternoon to put the icing on the cake by winning her match 7 and 6. Afterwards she said that she had played some very steady golf throughout, with Pars on most holes and was extremely pleased with her game. By this time our score for the day stood at 6 1/2 games won. We did in fact lose 2 games this afternoon, but overall their losses did not matter as the job had been done. Both girls, even though they lost, had learnt much from the experience at this level. What a day and what a win. This has moved us up the standings now and we are lying 3rd, behind Worcestershire & Herefordshire and Buckinghamshire respectively. 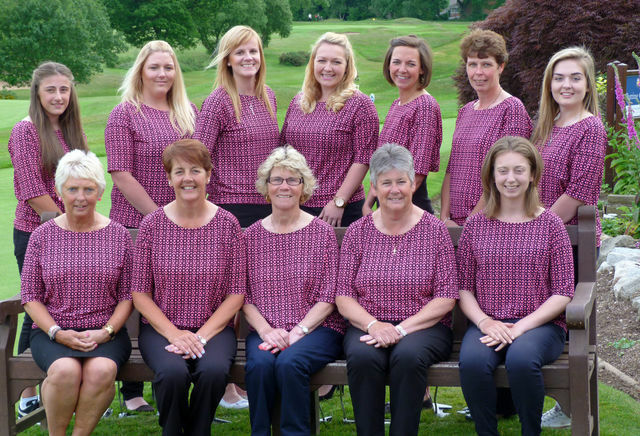 The Team are boyed up now and ready to take on Worcestershire/Herefordshire tomorrow who themselves have been playing some stunning golf this week. It should be a great encounter. Start times of 8.30 a.m. and 1 p.m. tomorrow. Thursday 25th June saw Warwickshire take on the very impressive Worcestershire/Herefordshire on this penultimate day. With Worcs/Herefords on top of the table and Warwickshire lying 3rd, there was alot to play for in this needle match with our near neighbours. Skies were a little grey and with some wind at the commencement of play (8.30 a.m.) however just after lunch the sun came out and it became really hot. 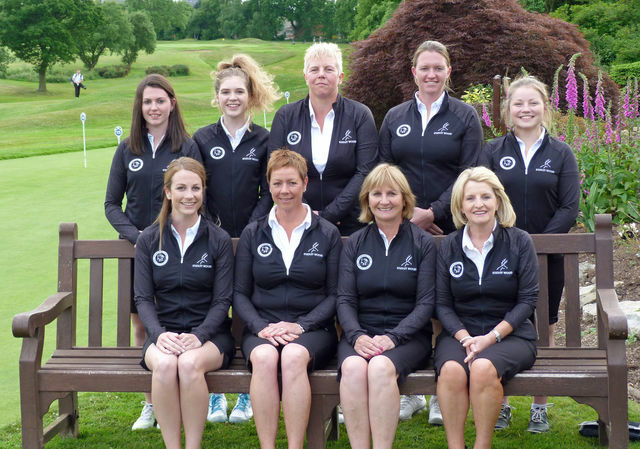 Once again it was Foursomes in the morning and the Warwickshire Team chosen was: Lisa BARTON & Adelle MIDDLETON, Claire HOWELLS & Charlotte PRIDDLE and followed by Kelly KNIGHT & Courtney MORRIS. In the first pairing, by the time they had completed the front 9, they were 1 up, having halved the 9th. The back 9 provided some great golf, results swinging both ways, but by the 18th Tee Lisa and Adelle were 1 down. All on the last hole then to try and get a half. Sarah CRANTON hit a superb Tee shot landing on the green but leaving a tricky downhill putt, whilst Adelle's Teeshot landed in the right greenside bunker. A superb Bunker shot followed from Lisa with Adelle sinking the Putt for Birdie which was then matched by the other pair. Half for the 18th, but for Warwickshire a Loss, 1 down. Oh so close this match but going all the way to 18 has got to be a good match. Match two somewhat got away from Claire and Charlotte as by the 9th they were 4 down but try as they might, and by George did they try, they could not pull back. Courtney and Kelly were playing some splendid golf and after halving the 8th hole, they were just 1 down, reducing this to 1 up after 13. All Sqare on 17th Tee, they lost the hole to a Birdie, making them 1 down. Both Tee shots landed way up the 18th fairway, and with a chip and a putt for Birdie by our girls, we thus Halved the match. Once again this pairing had provided some wonderful golf, keeping us excited to the bitter end! Charlotte HARTSORN was out first in the Singles and boy did she play well. With Birdies on 6th and 8th holes, by the 9th Tee, she was 5 up but then lost the 9th to a Birdie. Three more holes won on the Back 9, saw her winning 6 and 5. The next win came for Hannah McLOUCHLIN who had a really ding dong match with three Birdies en route to winning on the 18th. Winning 7 holes against 6, she won her match by 1 hole having played some excellent golf throughout the afternoon. Regrettably the other 4 matches did not go our way, however one went to 18th and one to 17th. One highlight in Gemma BRADBURY's round was on the 231 yards 10th hole, when her Tee shot flew into the left hand greenside bunker. Her Bunker shot then flew into the hole for an Eagle 2 to her opponent's Birdie 3 - some spectacle this!! Perhaps a little tiredness is creeping in for some who are not used to this format of golf competition, but all of the Team are going out with really positive attitudes and are playing great golf but with little reward in some instances. Spirits are high even though we are now lying 4th (by 1/2 point!). Tomorrow could be a splendid day as Worcestershire/Heredordshire who are lying 1st are playing Buckinghamshire who are 2nd, both with 4 points in the fixtures but with Worcs/Here having 6 more points from the games played. From Warwickshire's point of view, we are playing Oxfordshire, who are lying 3rd in the table, having won 2 matches, but only being 1/2 point ahead in game points. Positive reasons for being successful tomorrow for both Midlands Counties so there should be some excellent matches - let's hope there is not too much rain during the day. Start Times for these matches are 9.00 a.m. and 9.30 a.m. and then 13.45 p.m. and 14.30 p.m. for Worcestershire and Warwickshire respectively. Well the final day's play was upon us and during the day, whilst rain was forecast, only showers materialised until everyone was in the Clubhouse for the Presentation!! In fact few of the players seemed to notice any rain, they were so focused! Once again the course was immaculate and the greens were running very fast, which in conjunction with the tricky contours, made putting a thing to really concentrate on. From a Warwickshire point of view, the Team were playing Oxfordshire today in the hope of finishing third in the overall results. Foursomes pairings today were the strong pairing of Charlotte HARTSHORN and Lisa BARTON, Rachel RUSTED and Hannah MCLOUGHLIN and finally Adelle MIDDLETON and Gemma BRADBURY. Quite determined to do well this morning, the first two pairing were 1up and 2 up respectively with the third All Square after 9 holes. Charlotte and Lisa went on to win 3 and 1, having scored a few Birdies in their round, a very good start. The next matches went the distance with Adelle and Gemma coming down the 18th first, having been called through and being 1 down on the Tee. Unfortunately, they only managed a Par to their opponents Birdie and thus lost by 2 holes. On the other hand, Rachel and Hannah were 1 up after 17 and after halving the 18th, finished their match 1 up. As Rachel commented afterwards "My putter was just on fire this morning!" The afternoon Singles matches went out in this order: Charlotte HARTSHORN, Courtney MORRIS, Claire HOWELLS, Charlotte PRIDDLE, Kelly KNIGHT and Rachel RUSTED. Charlotte's match went all the way. All Square after 11 and then 14, she went 1 up on 15th when her second shot into the green was brilliant with ultimately the hole being conceded - 1 up. Halving the 16th in Par and then the 17th in Birdie, she stood on the 18th Tee, 1 up. Regrettably, after all that effort, Charlotte only managed a Bogey 5 to her opponent's Par. She thus Halved the match and was disappointed not to have managed a win. Charlotte though had contributed considerably to the Teams results, playing some wonderful golf both in Foursomes and Singles. Match number two saw Courtney have different fortunes. Losing the 5th to a Birdie and then the 8th to Bogey, she was 2 down. However on 10 she made a spectacular Chip to 6 inches to win the hole with Birdie to reduce to 1 down. Courtney then went into overdrive, winning the next 5 holes to win her match on the 15th hole, 4 and 3. A magnificent effort for this newcomer to Warwickshire, who commented afterwards that she had enjoyed the week enormously. Claire HOWELLS was next out with alot hanging on her experienced shoulders. Her match was nip and tuck all way round with both players playing very well. All Square after 4 holes, she lost the next to Birdie, pulling back to All Square after the 8th. She lost the 9th and then held on to the 14th when a killer blow from her opponent, when her Tee shot skimmed the hole and she Birdied to Claire's Par meant that she was 2 down. Halving holes to the 17th meant that Claire eventually lost her match 2 and 1. Great golf played throughout. At this stage, we needed the next three games to win for Warwickshire to win this match overall. Unfortunately this did not happen and even after some splendid golf being played, we lost all three. Such is golf at this standard, where margins are quite small and results can go either way. 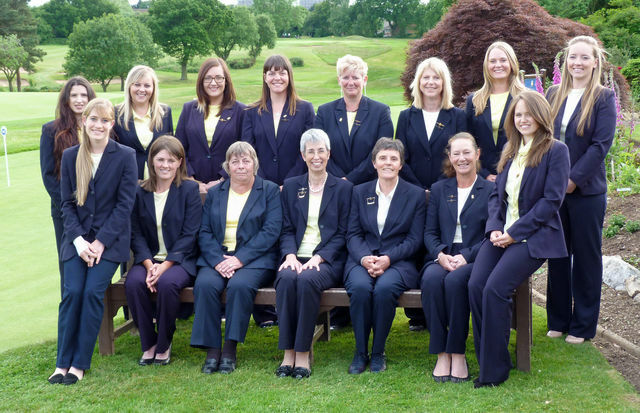 Overall, the week has not presented the result that our Captain, Karen HEARN had hoped for. Our girls had given their all in an enthusiastic manner with some fantastic golf being played over the 5 days by all Warwickshire players.